The Mercedes-Benz S-Class is best known as “the best car in the world.” The Mercedes-Maybach is built off of the regular S-Class, and that presents it with the challenge of making the best car, somehow, impossibly, better. This has made the car quietly one of the most entertaining vehicles ever produced. The important thing to remember about the Mercedes-Maybach (starting price: $168,000) is that it’s now no longer a unique standalone name in the Daimler empire but a rather high trim level of the Mercedes S-Class (starting price: $90,000). So the Maybach really feels like it has to justify its cost, which is why it is filled with as many wonderful, humorous luxury features as it is. That’s just fine. The essence of luxury is having things you don’t need, and don’t even have to understand. The idea was simple: take a completely normal, strenuous road trip, like the kind you would find yourself doing in some Chevy crossover or beat-up Subaru wagon, only do it in as opulent and expensive a car as I could manage. Get as extraordinary a car as possible and use it as normally as possible. Is the expensive car genuinely going to make the experience better? As it turns out, yes. Extremely yes. The road trip was easy to plan, as well. A former coworker of mine left New York to live in frosty Maine. My current coworkers and I hadn’t seen her in a while, so we quickly organized a 700-mile round trip journey to the snow-covered beaches up north. I mean, it would have been quick if I had booked an AirBnB at the first chance I had. Instead I waffled and ended up putting myself, two other people and one dog into a studio apartment in South Portland. We had a bed, a couch and a camping cot. We were fine. Fine, I tell you. The people renting us this studio were slightly confused why we had booked such a small (and affordable!) place when we arrived in a Maybach costing probably as much as the whole house, but that was just fine, too. To be specific, the Mercedes-Maybach S560 4MATIC we had could be bought for $180,545 thanks to such options as “High Gloss Polished Multispoke Wheels” ($5,000) as well as “designo Silk Beige/Deep Sea Blue Package” featuring “exclusive semi-aniline leather upholstery” and “porcelain DINAMICA headliner” ($1,000). Also, the car Mercedes kindly lent us came with “MAGIC SKY CONTROL” ($4,950). I would get the magic sky control if I were you. It lets you illuminate the sunroof in color-changing light. We turned it on once and it started cycling in and out of blue. It took us a while to figure out whether or not it was working or if we were just tripping out. We could not figure out how we got it to do that. A lot of the time you spend behind the wheel of the Maybach is spent contemplating how other cars are driving. Stuck in a traffic jam on the highway, I stared at the back of the Chevrolet Sonic ahead of us. The Sonic was less expensive than the Maybach to the tune of a house in most places, and yet it was just as capable at driving down the road as the more costly car. We both had four wheels, we both had five seats and were all stuck in the same jam. Was this Maybach really all that different, down in its core, I wondered? The wood and leather steering wheel (optional, no cost) echoes in my hands as I tapped it. Yes, I concluded. Obviously yes. First: my car had quilted leather and lots of it. The dash had quilted leather. Second: my car was unbelievably comfortable. The Maybach rides on air suspension, which you can individually set to comfort mode while you keep the engine and transmission in their more sporty digital settings. Pillowy ride when you want it, absolute power when you want it. Both at the same time. Ease. Control. Luxury. At a different point in the weekend, we took the Maybach on the same stretch of chunky potholed historic Portland street as we did in our friend’s first-gen Honda Fit. It was as if the Maybach re-paved the road smooth ahead of us while we were driving, so serene was the experience, so great the difference between the two vehicles. Fourth: my car came with an ineffable quality of distance. The quilted leather dash. The lighting controls stuck behind thirty eight menus you cannot and will not ever decipher. The robot driver function that hasn’t quite learned how to drive. The car really felt not only like it was working for you, but also that you (the insufficiently rich) would never understand it. I will also mention that the car is large. It is vast. The Maybach is nearly 18 feet long altogether, nearly five feet longer than that Honda Fit we’d been in. What’s more, it’s eight inches longer than a regular S-Class (215" vs 207") and that’s all in the wheelbase (133" vs 125"). Other dimensions, like standing nearly five feet tall and more than six feet wide, are the same, but at least the specs explain the sizable back seat room. The Maybach, then, is big. And it feels big. In sixth grade, my science class went on a field trip overnighting on a tall ship and then went out on it sailing into San Francisco bay. At one point, I and a group of my fellow sixth graders were tasked with pinpointing our location using triangulation. The ship suddenly felt very massive, and its motion very steady as I tried to spot one point, then another, then figure out where this moving ship was. Everything was momentarily grand and slightly incomprehensible and out of my control. This is the experience of driving the Maybach. It takes up about a lane and a quarter, or a lane and a half on New England’s more rural country roads. It heaves a bit and leans when you navigate a parking lot. SUVs look small in comparison. Houses look small in comparison. The back seat room, understandably, is best described as palatial. My six-foot-something buddy of mine sat in the back for a drive out to pick up some bookshelves and even with his feet stretched all the way out, he couldn’t touch the back of my front seat while I was driving. As for the bookshelves, they didn’t quite fit in the long-but-narrow trunk and had to slot into the right half of the back seat area, which would have been big enough to hold a medium-sized dresser if I had planned on it. As for accommodating a dog, the Maybach did quite well. This is Lizzie. She is a beagle-mix. She is not particularly fond of strange spaces. She is not particularly fond of traveling whatsoever. If anyone in the vehicle truly demanded luxury or held the Maybach to the highest standard imaginable, it was Lizzie. And yet it did not take long for her to get quite comfortable on the back seat of the car, or curled up on the remarkably plush, thick carpeting. Genuinely, the back seat area was so big it felt like its own contained space. That and the sunroof and relatively side windows made the light leather interior feel nicely airy. Oddly, fuel economy was pretty good. We recorded about 28 miles per gallon before refueling for the way back from Maine, drinking 16 gallons of premium over the course of 450 miles, and that included city driving across and out of dense Brooklyn. The tank is a wonderful 21.1 gallons. That the car weighs about five thousand pounds probably has something to do with this, but it feels like snobbery. If you look for it, you can see AMG badging down on some of the hoses that run around the engine bay. The Maybach comes with an “LED Intelligent Light System,” which doesn’t read like much but leaves an impression on you. When you turn off the headlights, they don’t blink off but rather dim down. When you turn them on, they swivel up then scan side to side, twirling their full width. The high beams do the same. It’s like a little light show. And the interior lights are also over the top. They are completely configurable from any color you want, or, if the menus are too complicated (they are) you can choose from preselected color combos that come with new-age descriptors. This all comes in addition to all of your heated and cooled seats with remarkably varied massage functions, your privacy shades, your chauffeur function that lets back seat passengers move empty front seats out of the way and more other luxury features than I can remember. I could probably kill a whole week of commuting testing for my most preferred kind of energizing massage, if I were to actually own this thing. I would probably kill another attempting to figure out all of the functions I can control from the back seat using the in-car remotes. The importance of all of this is that as well as being comfortable and powerful and anything else that’s readily understandable that you’d want from a car that is objectively but plainly good, you also get tons and tons of features and settings and tricks that are completely obtuse and unnecessary. That’s what’s fun about the Maybach. You spend a great deal of time trying to figure it out. You live with the Maybach as some kind of puzzle, one that once you figure it out, an accountant calls you to tell you that you’ve entered into a tax loophole has opened up another hundred grand for your investment portfolio. Does the Maybach justify its $180,000 price tag and, more importantly, its price differential to the regular S-Class, which is effectively $66,000 cheaper model-to-model? Yes. Duh. Obviously yes. The space alone would sell you on it against an ordinary S, and the comfort alone would convince you that it’s worth the cost over an ordinary car in general. And that’s putting aside the superiority you feel letting a dog hop up into a car with a back seat that’s as big as a Smart car while everyone else at Fort Popham Beach walks to their CR-Vs.
Now, I have been in the cars that ostensibly rival this thing. Rolls-Royces. Bentleys. And while they are very much the equal when it comes to power and comfort and while they have more distinctive looks inside and out, they feel like wholly realized vehicles of their own thing. The Maybach is more like a really nice car with a bunch of high-end karaoke bar added on. Remember that the S-Class is meant to exist as the best car in the world. The Maybach is then the best, plus extra. The Maybach is effortlessly capable, powerful and comfortable, but it is also gigantic and more than a little stressful to tool around in. It’s big and expensive, and there’s not much it can do. The AMG-grade V8 crushes the road ahead of it like one of those heavy mining dump trucks, but it’s not exactly spritely or nimble below highway speeds. 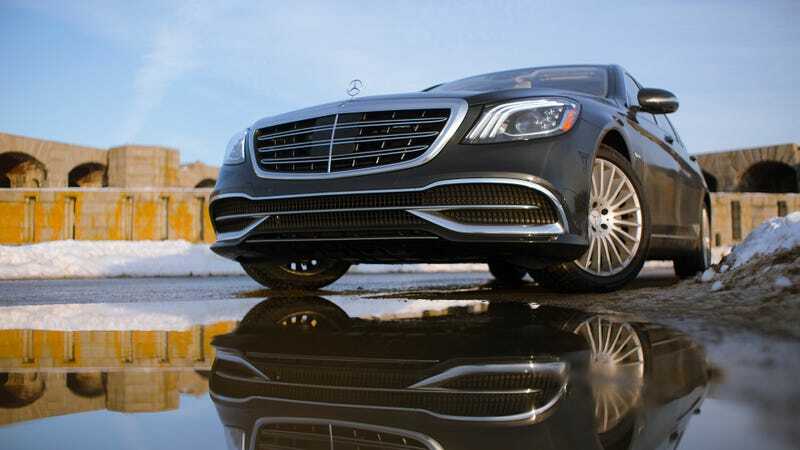 Mercedes does not publish a specific weight of the Maybach S560, but the regular Mercedes S560 comes in at 4,850 lbs. Car and Driver claims 5,017 lbs on their test model.